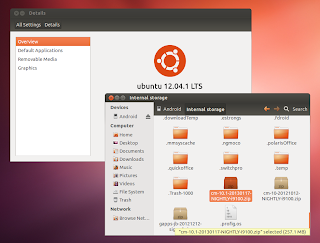 Like I was telling you a while back, Gvfs has been updated in Ubuntu 13.04 Raring Ringtail, bringing a new MTP backend which allows users to access Android 4.0 devices which do not support the USB Mass Storage protocol, along with many other changes. Since it's unlikely for the latest Gvfs (1.15.2) to be backported to older Ubuntu releases, you can use a PPA which has the latest Gvfs MTP backend backported to Ubuntu 12.04 and 12.10. We've already covered a way to connect Android 4.0 devices that don't support UMS to Ubuntu, using Go-Mtpfs, but that requires to mount the Android device manually. If you upgrade to the backported packages in this PPA, you'll get seamless MTP support so when you connect an Android 4.0 device via USB, it should automatically show up in Nautilus (or Thunar, it should work with it too) without having to manually mount it. You'll also be able to unmount it from Nautilus. I've tested the packages on Ubuntu 12.10 and 12.04 with my Samsung Galaxy S2 (Android 4.2.1) and Gvfs has worked as expected (with some minor issues though, see below) and I was able to transfer files to my Android 4.2.1 phone. Also, the packages were tested by WebUpd8 reader Bhaismachine (thank you!) in Ubuntu 12.10 using a Nexus 4 and he reported that the device showed up in Nautilus and further more, it seemed faster than before. Issues: transferring music using Rhythmbox or Clementine didn't work in my test (including in Ubuntu 13.04 - I've reported the bug HERE), but it did work with Clementine for Bhaismachine. So this part doesn't seem too reliable for now. Also, by default the image thumbnails are not displayed in Nautilus - to enable image thumbnails, open the Nautilus preferences and on the "Preview" tab, select "Always" for "Show thumbnails" under "Other Previewable Files". for some reason, there are no thumbnails for images on the Android device in Nautilus and the images can't be opened directly from the device but copying and viewing them on the computer works. These issues aren't Ubuntu 12.10 or 12.04 specific and they even occur in Ubuntu 13.04. In other related news, the latest CyanogenMod 10.1 nightly has added an option for switching between UMS and MTP/PTP mode (System Settings > Storage), so you can now mount Android devices via USB mass storage in Ubuntu. That means you won't need Gvfs with MTP support if you're using the latest CM nightly. The packages in this PPA may be unstable. Use the PPA at your own risk! There are instructions on how to revert the changes at the bottom of the post. 2. Then, launch Software Updater (previously known as Update Manager) and install the available updates. 3. Once everything has been updated successfully, restart your computer, unlock your Android device, connect it via USB and it should show up in your file manager (tested with Nautilus and Thunar 1.6). If you don't unlock the Android 4.0+ device, it may show up as empty in the file manager, at least that was the case for me. Update 13 February 2013: If your device is not currently supported, check out THIS list and if your device is on that list, add our Unstable PPA and upgrade libmtp (I've backported the latest libmtp from Raring to Quantal and Precise in this PPA). To revert the changes (downgrade all the packages from our Gvfs PPA to the version available in the official Ubuntu repositories), firstly install PPA-Purge with multi-arch support from the main WebUpd8 PPA. Wait for the packages to be downgraded successfully, restart the computer and everything should go back to the way it was before adding the Gvfs PPA above.